A quick and simple method for ensuring your ability to navigate in case of sudden power outages, emergencies, low light conditions that are dangerous or problematic and not easily fixed or even just in case of solar or alternative / off-grid power failures time to time - one can simply use glow in the dark materials. 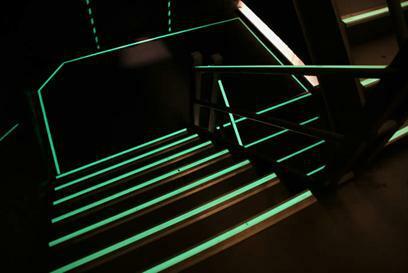 By either using glow in the dark tape or mixing glow in the dark powder with an epoxy or clear coat, one can illuminate or point out the edges of walls, doorways, walkways, staircases, low ceiling points, directional arrows for navigation in the darkness, etc. And with the recent advances in glow in the dark materials, the standard green lighting will last anywhere from 6 to even a full 24 hours! More than enough time to even outlast the darkness of night! And with 15-30 minute charge times, these materials can even be used to line or aid in navigating underground storage, cellars or basements on solar lighting that is switched on for only 15 or so minutes at a time, making the room or area fully navigable while saving a lot of power for more useful things like cooking or refrigeration!